The Ligurian Republic (Italian: Repubblica Ligure) was a short-lived French client republic formed by Napoleon on 14 June 1797. 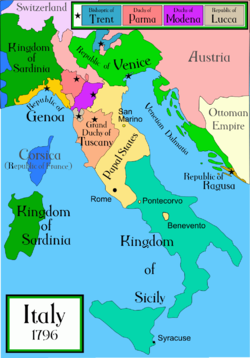 It consisted of the old Republic of Genoa which covered most of the Ligurian region of Northwest Italy, and the small Imperial fiefs owned by the House of Savoy inside its territory. Its first Constitution was promulgated on 22 December 1797, establishing a Directorial republic. The directory was deposed on 7 December 1799 and the executive was temporarily replaced bij a commission. In 1800 a doge was nominated for 5 years. In 1802 he was nominated for life. The Republic was briefly occupied by the Austrian forces in 1800, but Napoleon soon returned with his army. A new Constitution was published in 1801, establishing institutions more similar to those of the previous Genoan Republic, with a Doge who was president of a Senate. The Ligurian Republic used the traditional Genoese flag, a red cross on a white background. In June 1805, Genoa was annexed by the French. 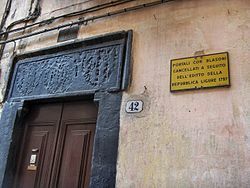 After conflict sparked in May 1797 between Genoese inhabitants regarding their wealthy rulers, Napoleon took Genoa and established his own order. The French engaged in a mass robbery of Genoa, leaving the people and their land in a ruinous state. Napoleon announced the existence of the Ligurian republic on 6 June 1797. The people's cooperation under Napoleon's domain was undoubtedly brought on in part by Archbishop Giovanni Lercari, who showed his support of the French only three days later. A Ligurian constitution was crafted, which was unprogressive and meant only as a temporary document. That December, the constitution's replacement emerged. A large majority approved the constitution by plebiscite. In June 1798, the rulers of Ligurian republic led the people into war against Piedmont after exiles attempted to form an uprising. 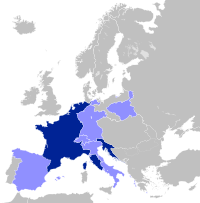 The French eventually intervened in the war, resulting in the French occupation of Piedmont. In 1800, the Ligurian republic was surrounded by the Austrian army and British fleet. An estimated 30,000 casualties resulted from the conflicts, and the French army had to be relied on for economic restoration. Eventually, the Ligurian leaders placed themselves at the feet of Napoleon, asking that he take direct control. He accepted. In June 1805, the area was directly annexed by France as the départements of the Apennins, Gênes and Montenotte. After the fall of Napoleon in 1814 the republic was briefly restored between 28 April and 28 July. Following the Congress of Vienna it was awarded to the Kingdom of Sardinia, and annexed on 3 January 1815. This article about the period of the Napoleonic Wars (1803–1815) is a stub. You can help Wikipedia by expanding it.